Zen Villa Haleiwa in the heart of Historic Haleiwa Town! Walk to everything! Unique private Zen Villa located in Historic Haleiwa Town (Known for its country atmosphere, excellent restaurants and quaint shops and the previous home of Bay Watch Hawaii!!). You can get away from it all or be in Waikiki in a quick 40 minutes driving. It’s really the perfect vacation home. Lanai and Hawaiian tropical garden with fruit trees and organic herbs surrounds the property that is perfect for relaxing. Relax outdoor and enjoy the gentle trade winds and birds singing in the secret garden paradise with water fountain. Plantation home style gated, recently remodeled into a modern Balinese atmosphere with high end Balinese furniture, teak hard wood flooring,fully equipped kitchen with granite counter tops (refrigerator, dish-washer, cook top, stainless steel oven, stainless sink, microwave, coffee pot, toaster, blender)split AC in all bedrooms, window AC in the living room, ceiling fans in all rooms,new appliances,screen windows, make this house a very desirable retreat. Close to world famous beaches, shopping and fine dinning walking distance. Master bedroom with king-size bed split AC+celling fan, private bathroom with river rock floor and deck patio. Second bedroom with a king-size bed,split AC+celling fan and deck patio, a third bedroom with 2 twins beds,split AC+celling fan. The living room all furnished and beautifully decorated and with cable TV/DVD, Internet WIFI,window AC and celling fan. Walking distance from famous Haleiwa Beach and minutes driving from world famous Sunset Beach, Banzai Pipeline, Waimea Bay and Falls. This house features everything you need to spend a few days relaxing in paradise. Come and feel the Aloha Spirit of Hawaii. Activities on the North Shore range from snorkeling with the sea turtles; surfing world famous surf breaks, hiking to the mountaintops, Horseback riding, Golfing or viewing the breathtaking beauty of the North Shore. Hawaii's 'Polynesian Cultural Center' is 20 minutes drive by car. Visiting Waikiki there is shopping opportunities along the way in Pearl Ridge Shopping Center, Aloha Stadium's Famous Swap Meet, and Ala Moana Center. I am a very active person who loves to work with people. I am from South America came to Hawaii to live with my family in 1996 . I graduated from BYU in the winter 2008 as a Art Major.I love to work with the Zen Vila where I enjoy so much decorate the houses, gardening outside the Villa, and make my guests very happy with their stay. Everybody fall in love with the place and they love the convenience of walk to the Supermarket,dining, and shopping at the local stores. The Zen Villa is truly a wonderful place! Once you in the property you have peace,space and style. I am always thinking on ways to make it better, to looks beautiful,it is truly my favorite piece of art! Come and enjoy this fun and peaceful Zen Villa and Space. Mahalo and Aloha!!! I love being in Hawaii!!! It is the perfect location! Trully peaceful and convinient! I enjoy everything the garden is beautiful, the sounds of the water fountain, the nice environment is truly wonderful! toilet, shower, New bathroom just added! toilet, shower, Rain shower,river rocks flooring,really nice! toilet, shower, In the main hallway!Glass door,natural stone flooring,..
Balinese natural stone floor.All three with walking shower,grant counter and sink.Really nice! One parking space is available for you.Please if you will need more parking let us know in advance. Turtle Bay and Waialua recreation center. We loved staying at the Zen Villa in March 2019. Our family of 5 found the house roomy and comfortable with a feel of old Hawaiian charm. Pros include having 3 separate bathrooms to go with 3 bedrooms which our 3 daughters greatly appreciated. We also found the updated kitchen to be well stocked with everything we needed. 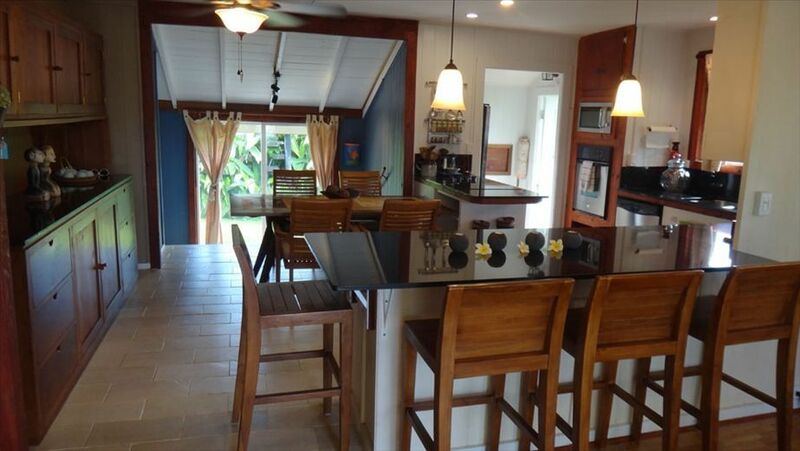 Location is in the main part of Haleiwa so very easy to walk to grocery store and restaurants. The closest beach is a quick 2 minute drive for surfing / paddle boarding. Main North Shore Beaches (Banzai Pipeline, Waimea Bay) are a 15-20 minute drive depending on traffic. Owner was very responsive to inquiry and honest that the house is actually behind a store front that is being remodeled which didn't bother us as the house is tucked behind a privacy fence / bushes that give it a very secluded feel. The one negative call out would be that the neighbors have a rooster that will make noise during the night. I don't know if the owners could do anything about that but it's a minor complaint overall. Would definitely consider renting again. We really enjoyed staying at the Zen Villa. The home was great and had everything we needed. Our 2 year old son loved the garden and we really enjoyed sitting out on the deck under the sun. The place is right in the middle of town with easy access to all the shops and restaurants, but tucked away so it really feels private. I'd definitely recommend checking this place out if you want to stay on the North Shore. This lovely house is tucked with in a beautifully landscaped yard. There are multiple windows in the living area letting in lots of light, the kitchen is well equipped and the beds are comfortable. Everything is within walking distance, grocerie store, lots of shops and the beach. Ideal house for families. We loved our recent stay at this house! It was perfect for 2 couples and 2 kids. Our kids loved running around the beautiful yard with the fruit trees. We really appreciated how close it is to so many great businesses—we walked to so many restaurants and shops, and the grocery store is right next door! The traffic can be bad in Haleiwa, so being able to walk is awesome. We used the washer/dryer several times and they worked well. The air conditioner in each bedroom was great! It was actually quite cool and windy when we were there (early Feb), so keep that in mind if you want to swim. Multiple beaches are just a short drive away, but the waves are quite big there in the winter (which is good for the surfers, but not for little kids swimming). There is another rental house very close by, which might be a problem for some folks, but was just fine for us. Also, there is no bathtub, which some families with little kids might want. Overall, though, this is a wonderful house, and the walkability is amazing!! We’d love to go back, perhaps in the summer when the waves are smaller:). Very easy to access and we had a very enjoyable stay for four nights. Wish we could have stayed longer.